OECD (Organization for Economic Co-operation and Development) 30 developed countries, such as European countries, United States, Australia, Korea. Please contact UNITAS for details. Or until positions are filled. 6 month payment applies to some countries. Including material and event/active fee. Students starting in January and July need to pay first 9-months. Half-year tuition payment is acceptable from following terms. College student visa holders should purchase accident insurance. After arriving in Japan, residents must acquire National Health Insurance. Students who wish to leave school must report to Unitas and fill out a form one month prior to the month you plan to leave. Suspension of activities need to be approved by Unitas. We do not refund Screening Fee under any conditions. When you are not qualified for VISA at Embassy in your hometown after Certificate of Eligibility is issued, we will refund the tuition excluding screening fee, entrance fee and remittance fee. We do not refund the first 6-month tuition after entering Unitas under any condition. We do not refund students who have paid 1-year or 9-month tuition fee and have already studied at Unitas for over 6 months. Students who have paid for 1-year tuition in advance but stayed at Unitas for less than 6 months are eligible for a 6-month tuition refund excluding the discount fee. The amount refunded is 260,000 yen for students at the Kofu campus and 305,000 yen for students at the Tokyo campus. After the second payment has been made, we do not refund students who are still registered at Unitas but do not attend classes. We do also not refund students who have extended the period of study. Students who have paid 1-year tuition on their second payment apply for the above refund policy 3, 4, 5. Students who have paid 9-month tuition in advance and leave Unitas within 6 months, we are able to refund the last 3-months tuition. The amount refunded is 140,000 yen for students at the Kofu campus and 162,500 yen for students at the Tokyo campus. We do not refund insurance fees. Students must be responsible for bank remittance fees. 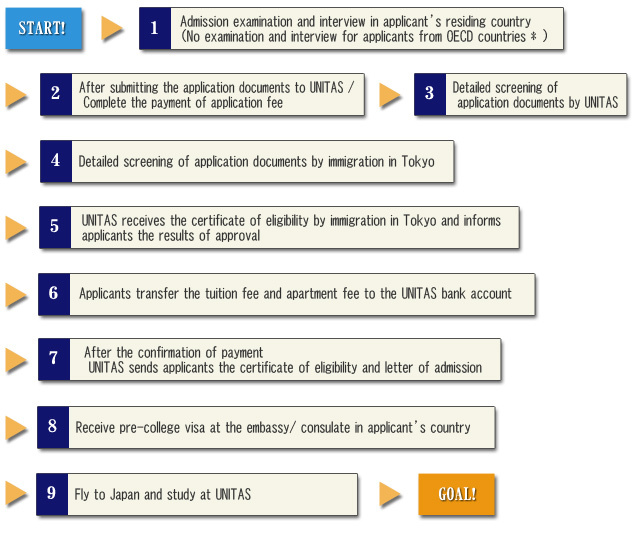 Required documents depend on the applicants' country. Please contact UNITAS about other countries. All documents should be issued within 3 months.